The crown is composed of a silver frame, lined with gold, and set with 2,200 diamonds, mainly brilliant-cut, with some rose-cut. 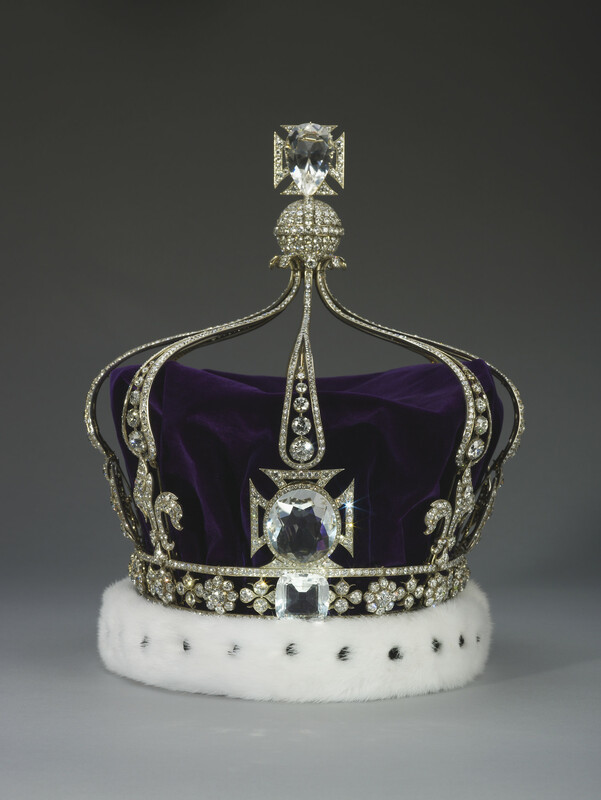 The crown has an openwork band, set at the front with a detachable rock crystal replica of the diamond, Cullinan IV, a large cushion-shaped stone, and a frieze of quatrefoils and rosettes, each with a large brilliant in the centre, surrounded by smaller stones, between borders composed of single rows of brilliants. Above the band are four crosses-pattée and four fleurs-de-lis. The front cross is set with a detachable rock crystal replica of the Koh-i-Nûr diamond, the other three crosses are set in the centre with a large diamond each. The eight detachable half-arches each taper towards the top, and terminate in scrolls, and contain six graduated brilliants, between borders of stones. The monde is pavé-set with diamonds and surmounted by another cross with a rock crystal replica of the pear-shaped diamond Cullinan III in the centre. The crown is fitted with a purple velvet cap with an ermine band. Queen Mary's crown was designed for the coronation of June 1911. The Daily Telegraph described it saying 'It has no jewels but diamonds, and the diamonds cluster together as if they had no support but their own light.' The design was inspired by Queen Alexandra's crown of 1902 which has similarly elegant arches. Queen Mary also wore the crown without its arches as a circlet, in particular for the coronation of her son, King George VI at the coronation in 1937. 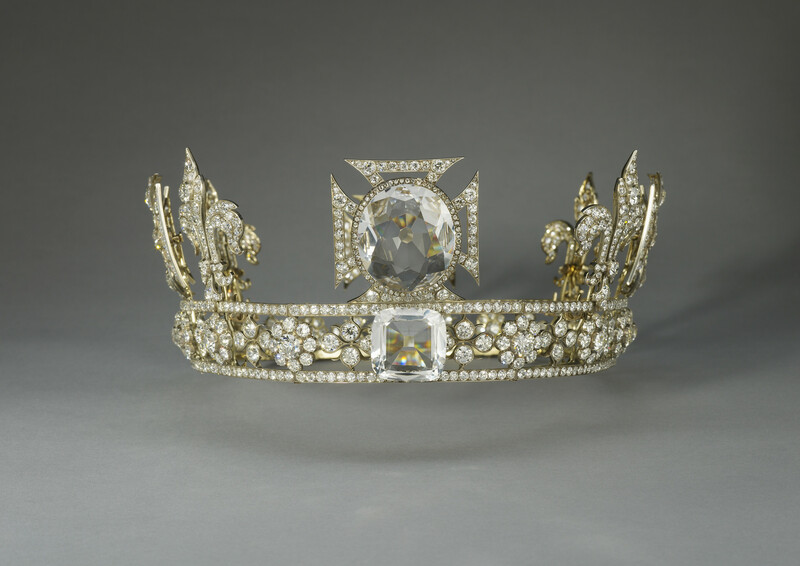 At the 1911 coronation the crown contained the three large diamonds - the Koh-i-Nûr, and Cullinan III and IV, (also known as the Lesser Stars of Africa) which were later replaced with quartz crystal replicas so that the jewels could be used in alternative settings. The Koh-i-Nûr was moved to the crown of Queen Elizabeth the Queen Mother, and Cullinan III and IV were set as a brooch. These two stones are part of the famous Cullinan diamond, the largest diamond ever found. The full stone weighed 3,106 carats and was discovered at the Premier Mine near Pretoria in 1905. It was named after the chairman of the mining company, Thomas Cullinan. In 1907, it was given by government of the Transvaal to Edward VII for his sixty-sixth birthday. The following year it was sent to Asschers of Amsterdam to be cut. The cuts resulted in nine numbered stones - known as the Stars of Africa. The largest of these stones, Cullinan I, was placed in the head of the Sovereign's Sceptre, whilst Cullinan II was set into the Imperial State Crown, although both remained detachable and were worn occasionally by Queen Mary as a brooch. Queen Mary had Cullinan III, a pear-shaped drop of 94.4 carats, and Cullinan IV, a square-cut stone of 63.6 carats set into her crown, but they were also detachable to be worn hooked together as a brooch (known as the Cullianan Brooch) or occasionally as a pendant to a necklace. Commissioned by Queen Mary, consort of King George V, from the Crown Jewellers, Garrard & Co., for the coronation on 22 June 1911.